If you follow me on Instagram, then you'd know that the Etude House Color Pop Lip Tint in #08 Berry Pop would be one of my most favourite lip products ever! Yes, this is the one lip product that has popped up on my Instagram ever since I bought it in March. That's 5 months ago, so yes, it's been popping up in various Instagram posts, like this, this, this, this, this, and I liked it so much I went back to get two more! So I figured, it's about time for a proper review/swatch post of this on my blog! 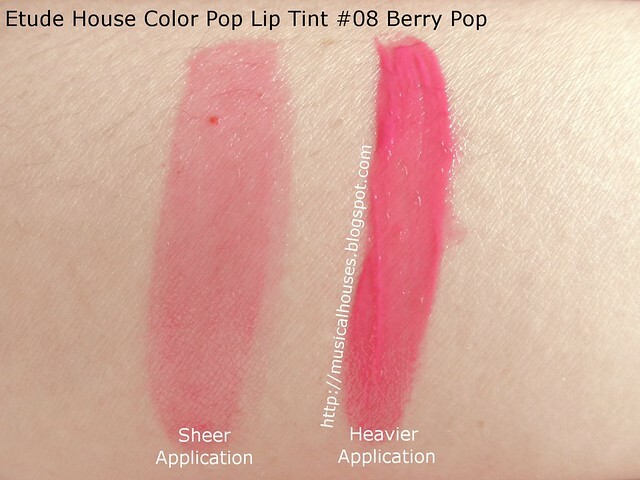 Etude House Color Pop Lip Tint in #08 Berry Pop: My current favourite liptint! 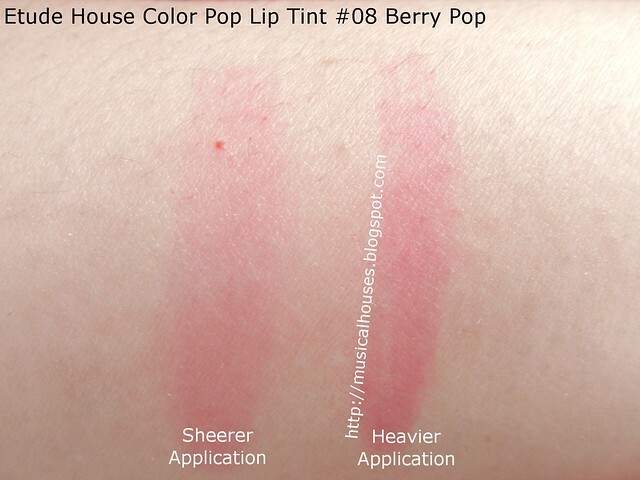 The Etude House Color Pop Lip Tint has a few different shades (8, I think, although when I was in Korea there were additional shades in mini-sizes too), and the one I have is #08 Berry Pop. It's in a compact little plastic bottle, with a tulip-shaped doe-foot applicator. 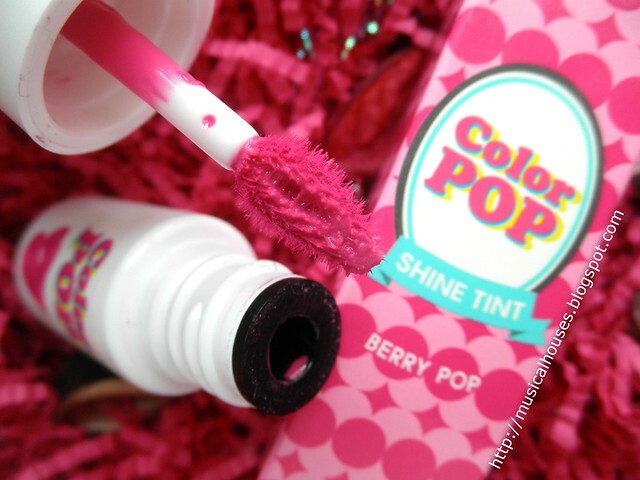 Etude House Color Pop Lip Tint in #08 Berry Pop: Cute packaging as is typical of Korean brands. 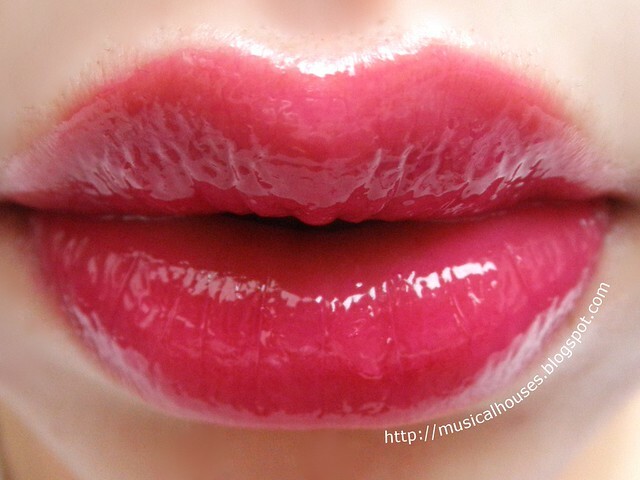 #08 Berry Pop is a cool-toned bright pinky plum, which is a colour that is right up my alley. It looks pretty bright at first, but can be worn sheerly or more heavily to suit your colour needs. Below, you can see the swatches done both ways. It's not as neon-pink as it appears in the photo below, my camera just was a little bit wonky. And of course, lip swatches! Let's take a look at the sheer swatches, which is just one coat of product. You can see that it doesn't fully cover my lip shade, and it just gives this sort of overlay of bright pinky-plum colour, with some slight glossiness. It's pretty wearable this way, adding a touch of bright colour, but without being unwearable or screaming "I'm wearing lip tint!" And below, a heavier swatch, which is how I usually wear it, because you know I love my pinky-plum shades. As you can see, with a couple more coats, the colour really amps up, and so does the glossy factor. The great thing about lip tints is that they don't feel very heavy on the lips, and unlike lipstick or lipgloss it's easier to build them up, because the texture of the product is like water that sinks into your lips. Some liptints can be pretty drying, but this one isn't. I'd say it's probably kinda like some of the more watery tints I've tried in terms of feel (e.g. Benetint). As you can tell, I've been wearing this for quite a few times, and I really like it, for the gloss-like feel on the lips, as well as the fairly good lasting power. Once it dries on the lips, I've found it to be pretty good at holding up to talking, and eating dry foods (like, say, a biscuit). It starts fading once I eat oily or soupy foods (like chicken wings, or creamy soups), but that's to be expected. So yes, I do reapply after meals, but otherwise, it does a pretty good job of holding up throughout the day. Below, you can see how the swatches stained my skin when I tried to wipe them off with a tissue 5 minutes later. Enough FOTDs? If you want one more, you can see the very first FOTD I posted on Instagram with this product. So there you go, that's probably my current favouritest lip product that I've been wearing regularly. I love everything about this - the glossy finish, the ability to sheer it out or build it up, the gorgeous bright-but-not-too-bright wearable pinky-plum colour, and I just had to share! The Bottom Line: The Etude House Color Pop Lip Tint can be worn sheerly or heavily, with a nice non-drying glossy finish on lips, and great colour to boot.